Necromorphs and zip wires confirmed for the next game. While a new Tomb Raider hasn't yet been announced, some guy named Tom Braider has revealed who will be in charge of the inevitable next game: one Ian Milham. That's the same Ian Milham who served as art director on the Dead Space series, and creative lead on Battlefield Hardline, meaning that Lara will definitely be fighting necromorphs and crooked cops in her next adventure. That's how game development works, everybody, and I refuse to believe accounts to the contrary. "Ian is one of those rare veterans who combines creativity, artistry, and passion into excellence on-screen. It’s a matching type of DNA that Crystal Dynamics has forged itself upon over these last few years. We’re very excited to welcome Ian as the newest top-tier talent joining our studio. His attitude, aptitude, and aspirations for crafting great game experiences are perfectly aligned with who and what Crystal Dynamics is all about." "Adventure games have always been my first love. When the opportunity came to join Crystal Dynamics, I had to jump on it. 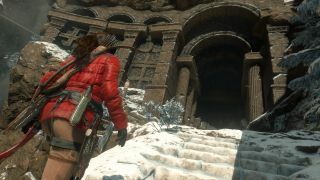 This is the home of Lara Croft, who is a legend in action-adventure gaming and a pillar of the industry. I’ve admired Crystal’s work for a while now, as they continue to deliver top notch narrative and spectacle, coupled with deep systems and player choice. I’m very excited about where the studio is headed and I’m eager to be a part of it." "Also, I'm totally adding necromorphs, like what Tom said." Head here for the full press release, and to see if I made that last part up.